I won’t lie, I do love a good NetEnt slot and whenever I hear news that one has been released I am always keen to get my slots gaming on and give it a try. The Wish Master was one that came hot on the heels of the very underrated Lights slot so I was keen to see if NetEnt were going to carry on their great form. 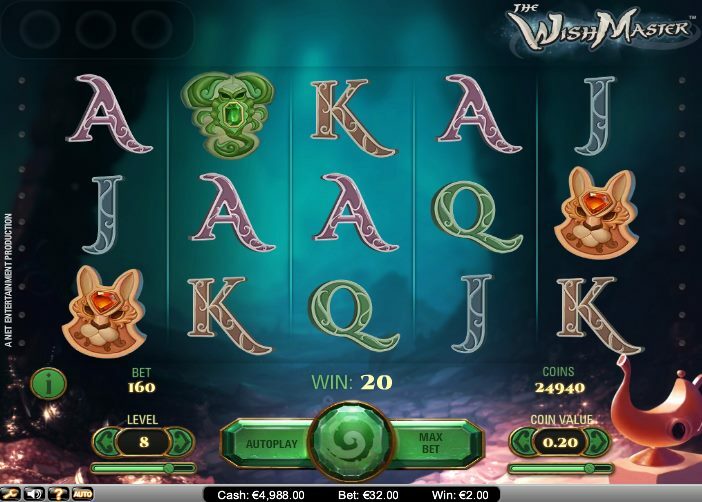 The Wish Master is a 5-reel, 20-payline slot with an Aladdin theme. The story goes that if the genie is released from the lamp when somebody rubs it then he will grant that person three wishes. Obviously, the standard rules and stipulations occur about not being able to wish for more wishes and being careful for what you wish for but this is slots world. Screw the rules! We want big wins! You can earn up to 900,000 coins on this slot, so brace yourself! The symbols are very Arabic as you would expect. There is a green scorpion, blue falcon, orange cat, pink viper and the regular Jack through to Ace symbols. You will also find the lamp that holds the genie waiting suspiciously in the bottom right hand corner of the reels. The lamp symbol is the trigger to a lot of happiness on this slot. If you hit just one of these symbols across the reels then the Wish Master (the game’s name for the genie) will grant you a random bonus feature in the form of Extra Wilds, Expanding Wilds, Random Wilds and multipliers. The Wish Master also has the ability to turn an entire reel Wild. How long will these bonus features be in place for, I hear you ask? Well, at the top of the reels, a number of spins will appear and that will determine how many spins the bonus feature will last for. It is also possible to add or re-trigger bonus features if you hit the lamp symbol across the reels during the spins where a bonus feature is active. 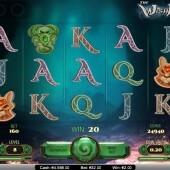 The Wish Master is a more unique slot from NetEnt. It does not simply rely on a bonus feature and free spins bonus round. Instead, you can hit a number of bonus features at any time and the fact you only need to hit one lamp symbol across the reels, as opposed to the 3-5 Scatters required in other slots, does make it more exciting. The only downside is the lack of free spins but spins with features can be just as much fun, albeit slightly more costly. If you are looking for more Aladdin-themed slots action then you might want to check out the action-packed Aladdin’s Wishes from RTG. I cannot guarantee you will enjoy it more than this NetEnt release but it is far from a poor slot.